Bodyweight squats are a fantastic exercise for beginners and advanced individuals alike for developing the lower body and core muscles. This exercise can be done as a warm-up before getting into heavier squats or done at the end of the workout program to really push blood into the muscle tissues and bring yourself to a state of fatigue. 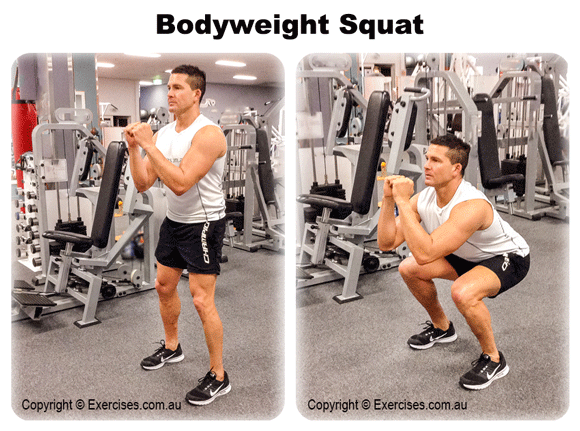 Bodyweight squats can also be performed during a cardio circuit workout because they’ll get the heart rate up quickly while burning up a good number of calories. Best of all, they can be easily done in the comfort of your own home as all they require is you, a pair of running shoes, and an open space. Stand upright with your arms by your sides. Feet should be about shoulder width apart. Keeping the chest and head up, slowly bend the knees as you lower yourself down to the ground, pausing once you’re in the lowered position. Press back up from there to complete the rep.
To ensure maximum results from the bodyweight squat exercise, be sure to lower the bum so it’s as low to the ground as possible. Some people make the mistake of only coming partway down, which will reduce the total tension being placed on the muscles. Also watch that the knees move directly over the toes as you lower yourself down to the ground to avoid grinding forces being placed on the knee joint. Keep the head looking forward or you may find yourself adopting a forward lean.